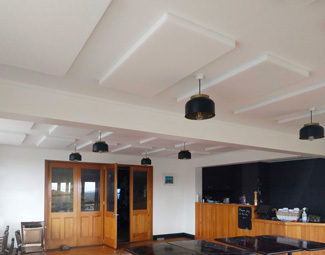 A selection of photos from hundreds of home and professional studios, restaurants, cafes, bars, church halls, schools, gymnasiums, offices, home theatres and swimming pools throughout New Zealand using NZ Acoustics' panels and products. 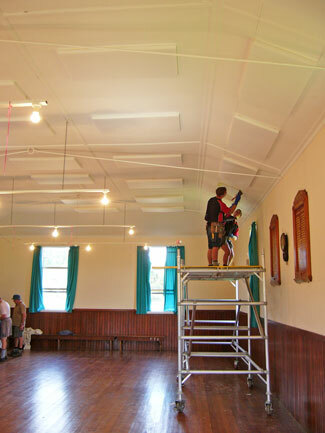 White acoustic panels with beveled edges glued to the ceiling of an historic central Christchurch school classrom. Note how the panels have been cut around the ceiling faixtures to provide a very classy look. White acoustic panels suspended from the ceiling. "Eight panels up and there is definitely an improvement. Thanks again for your response while on holiday. The trick with melting a hole was perfect - we used a nail and lighter - great trick." 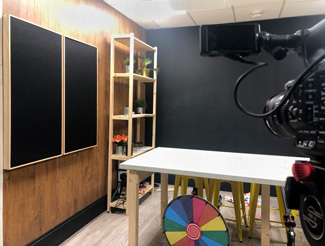 Black acoustic wall panels with pine frames in the video recording Studio of a Vlogger. "Honestly we couldn’t have asked for better service. The panels are such good build quality and they look stylish! The sound we get is so much better now." 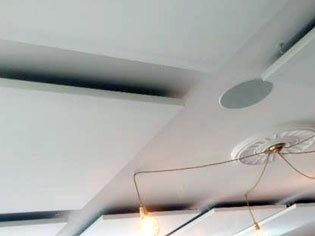 Black acoustic ceiling panels on the ceiling of a brand new and very stylish Christchurch Cafe on Lichfield Street. 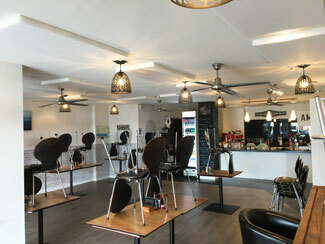 A 36% ceiling coverage gave this cafe a wonderful ambience and the panels were easily and quickly installed by the owners. 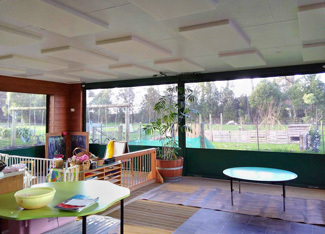 White acoustic ceiling panels on the ceiling of a country Pre-School near Hamilton. The owners, having tried several remedies in this very noisy room, say "They work a treat". 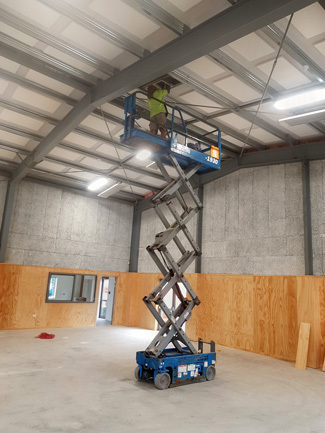 168 White Acoustic Panels were quickly and cost effectively glued directly to the roof of this new 18m x 18m school Hall in Kaiapoi. The results were specatacular with a reduction in reverberation time (RT60 reading) from around 2 seconds to 1 second. 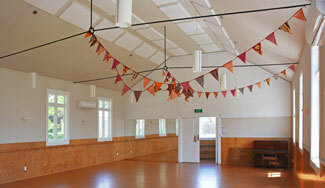 This is now one of the best sounding halls we have heard in New Zealand. Black acoustic ceiling panels in a brand new and very stylish Christchurch Cafe on Oxford Terrace. 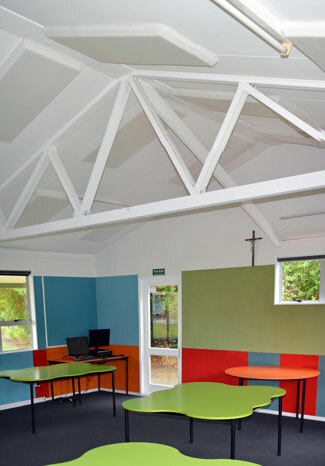 New style beveled white ceiling acoustic panels gave this classroom at a Christchurch primary school a different feel. 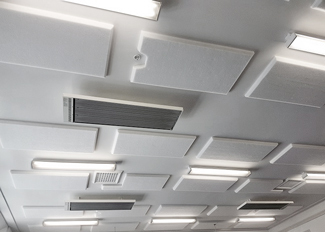 With just 36% ceiling coverage the panels significantly reduced the unwanted reverberation. The panels were installed by the school maintenance staff. 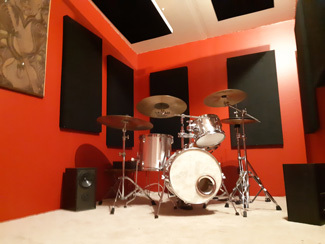 Black 50mm thick acoustic wall panels and suspended sound cloud panels in a recently completed drum practice and recording room. The owner comments that "Sounds great, I'll be spending many hours in here thanks to those panels". Black acoustic panels have been fitted to the rear concrete wall of these Auction rooms to help reduce the reverberration from the PA System. "We put up the panels yesterday, the whole job took around 4 hours and What a Difference! that's an added bonus. Thanks for your help. We are really pleased with the result and just in time for a 50 pax dinner this Friday too." A very busy central city Cafe in Christchurch. 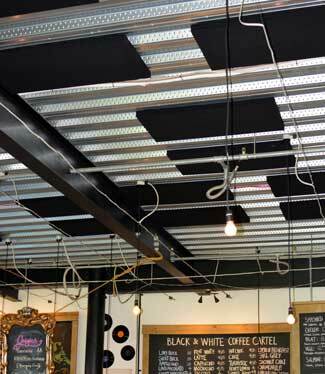 The black acoustic panels fit perfectly with the modern "industrial" look exposed ceiling. The proprietor is thrilled with the results and says the cafe is now "buzzy but no longer rowdy" when packed with coffee lovers. 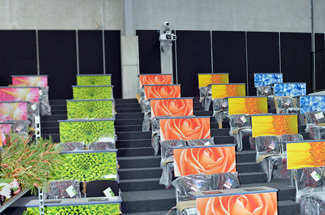 A school Art Classroom in Christchurch. Often a very noisy environment - this Classroom was fitted with 36 White Acoustic Ceiling panels to provide both teacher and pupils a quieter, and more productive environment. Cafe with white acoustic ceiling panels. 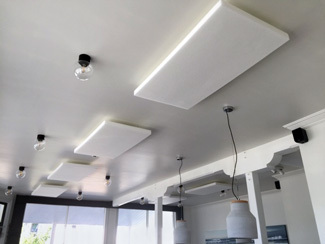 Just 12 panels made a tremendous difference to both the clients and the owners of this popular Paraparaumu Cafe and Restaurant. 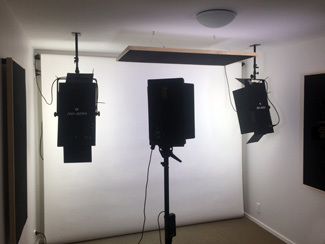 A Queenstown photography and film studio with attractive pine framed acoustic panels on walls and ceiling. Note how the wall panels have 25mm spacers and the ceiling panel is suspended to maximize reverberation absorption. 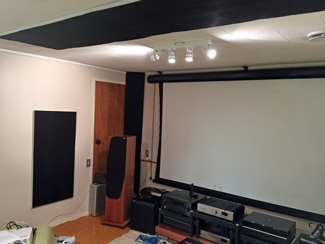 A back wall acoustic panel and two corner Super Bass Traps reduce unwanted reverberation and improve the quality of the sound in this beautifully appointed New Zealand Home Theatre. 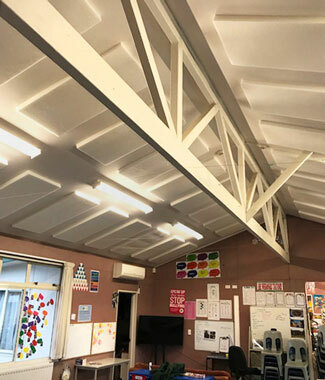 Ceiling Acoustic panels have dramatically reduced classroom noise for both teachers and pupils at Christchurch's Avonhead School. The majority of unwanted noise is created by floor to ceiling sound reflections rather than wall to wall. The 50mm thick panels will absorb not only male and female voices but also music. 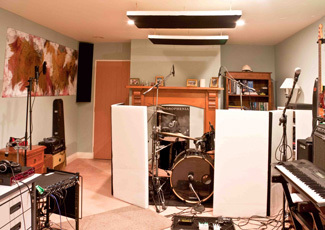 Home studio with two Gobos (folding acoustic screens) surrounding the drum kit and a suspended ceiling sound cloud. This stops cymbal splash when practicing and recording drums. 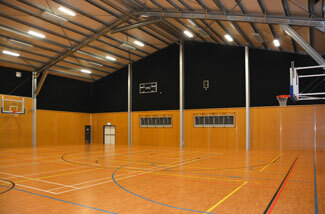 The reveberation in this large Canterbury multi-purpose Gym and Theatre was reduced from a whopping 3.00 seconds to 1.50 seconds with black impact resistant acoustic panels. A row of very smart black and white acoustic wall panels tame the echoes and improve the working environment in this attractively renovated finance company reception and office area. "We were barely half way across the ceiling and the builders and the Board members helping could sense the reduction in the echoing. Now it’s finished there is a marked improvement in sound quality. I can report the Board is very pleased with the result and can’t wait for the first crowd of people to be in the hall to hear the difference from previous." 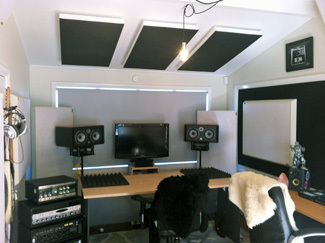 Three suspended acoustic "sound cloud" panels over the mixing position. 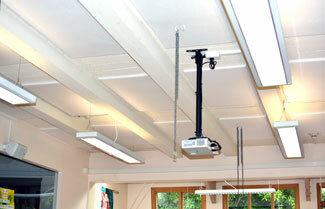 These are designed to stop ceiling refelections which makes it faster to acurately mix and master songs. 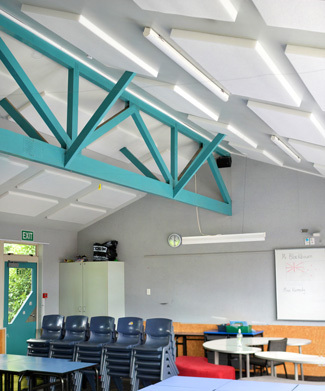 White Polyester Acoustic Panels on the ceiling of classrooms at Birchwood School in Nelson. The principal comments: "We are very very pleased with the immediate impact of the installation of the Acoustic Tiles. The teachers describe it as having a 'warming feeling' throughout the two rooms. The tiles have also certainly stopped what we would call an 'echo effect' across the rooms." 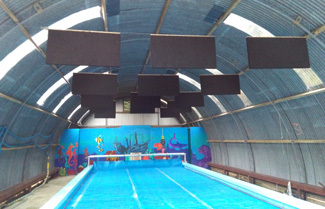 Black super heavy duty baffles suspended over an indoor school swimming pool. These baffles are inexpensive, have a very high NRC (noise reduction coefficient) rating and can withstand a lot of punishment. High quality audio listening room in Auckland. 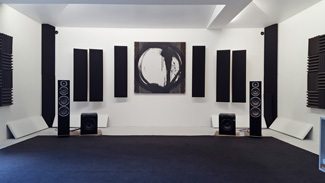 Includes corner and wall Bass Traps in an attractive design and very effective result for testing high-end audio systems. 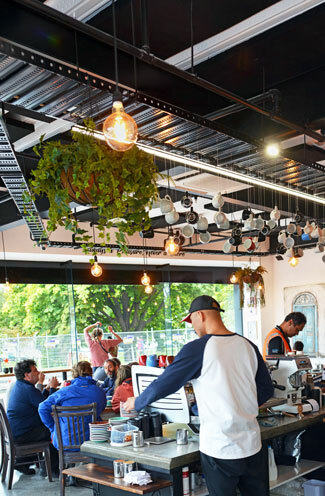 These classy suspended custom-made "Fabric Panels" have helped this Christchurch Cafe become one of the city's top venues with a large number of very loyal patrons. A "Custom Art Panel" featuring a high quality close-up photo puchased by NZ Acoustics Ltd on behalf of the client from a major Stock Photo Agency and blown up to fit on this large acoustic panel. The price is similar to a Canvas Print but the print quality is higher with the added benefit of improved room acoustics. 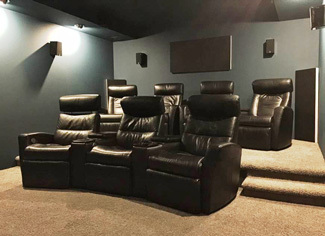 This home theatre features floor to ceiling corner Bass Traps and matching wall and ceiling acoustic panels to even out the sound throughout the room and clarify the stereo field. This beautiful and historic Christchurch Church Hall suffered from very poor acoustics. White acoustic panels on the end walls and ceiling have completely transformed it's sound and useability. 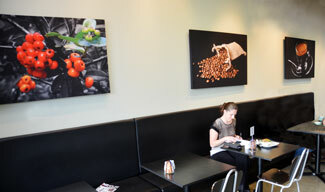 "Custom Art Panels" covered in high quality Dye Sublimation prints enhance the look of this popular Christchurch Cafe while reducing the echo from the hard surfaces. 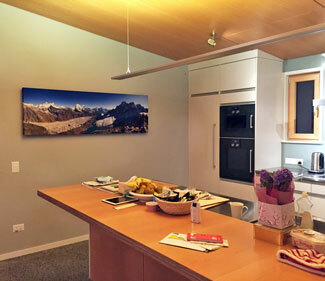 Modern kitchen/ dining room area with a "Custom Art Panel" on the far wall featuring a high quality and dramatic panoramic photo of Mount Everest (shot by the client) to reduce the reverberation and noise. Super Bass Traps placed floor to ceiling in all four corners of a popular Auckland recording studio to reduce low mid peaks and boominess. 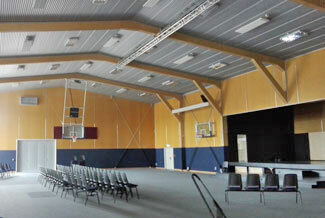 The reveberation was reduced from 1.35 to 0.85 seconds in this multi-purpose School Gym and theatre complex by a range of acoustic treatments including 50mm thick Polyester panels above the ceiling perforated aluminium. "Thank you for going the extra mile by giving me your advice on my room. The panels work really well and I can now hear mix details I couldn't before. Magical." "We've been aware that since we opened our new cafe, it can be a little noisy when we're busy and the acoustics haven't been great. NZ Acoustics Ltd ( we can really recommend these guys) have come up with a result that not only looks good, it actually works. For the boffins out there, we have reduced our sound resonance from 1.3 seconds (not brilliant) to 0.6 seconds. 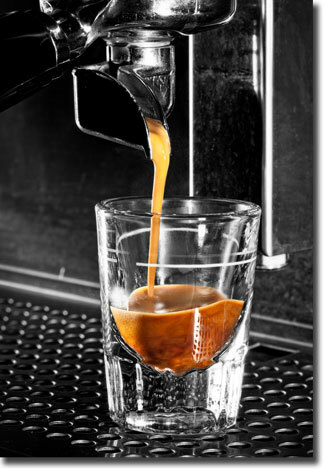 The latter is considered a good benchmark figure for restaurants and cafes." "Excellent product, very powerful for taming unwanted bass and letting more of the music through." "Great Gobo! Love it. Great absorption. Great results. A+"
"The imaging of my monitors has been enhanced - it places instruments so well that it feels like you could reach up and touch the sounds." "Amazing, perfect product! Can’t believe it for the price! 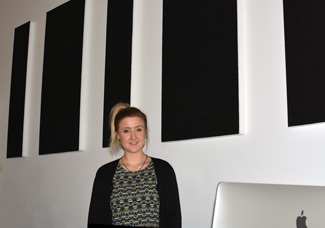 A++++++++++"
"Acoustic panels and bass traps have made a huge difference to my drum room. Sound used to bounce around the room creating a muddy mess of noise. But now the bass drum sounds tighter and has real punch, the cymbals have controlled, faster decay and snare and toms really pop. I can also hear backing tracks while I'm drumming much clearer now. 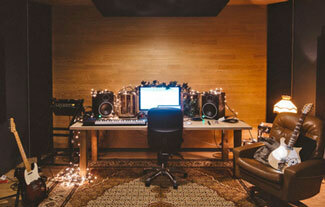 So much better A+++"
Get the acoustic panels the professionals use and enjoy all the benefits of a great sounding room at a very reasonable price.